Commercial Real Estate (CRE) transactions range from the fairly simple to immensely complex! The degree of transaction complexity can be mitigated by an educated and understanding commercial real estate broker who has expertise in your type of transaction and the resume to prove it. A broker’s education and experience on specific sides of the transaction make he/she more understanding and knowledgeable of the other side’s needs. If you’re a commercial real estate landlord, you should seek out the expertise of a broker / agent with a significant amount of Landlord Rep. experience as the needs for a landlord typically differ from those of a tenant. It would also be beneficial to you if that broker/agent also has tenant representation experience, so they understand what typical expectations are from small business tenants to corporate tenants, etc. Transactions that could be much simpler than they end up becoming are often the result of a lack of effective communication between the various parties – landlord, tenant, another broker, etc. In addition to communication, it also varies based on the level of trust that your client or even the other side of the transaction has in you and your expertise. Building trust along with adding value to the transaction for the person(s), company, etc. that you represent is essential from the outset. Let’s say that you’re referred to a tenant who has been in the same space for 10 years and now wants to either expand in place, relocate or compare buying a building to leasing. As a new person, expertise aside, in that tenant’s world, they need to become extremely comfortable in your knowledge level, sincerity and in the simple fact that their needs, short and long-term goals, and other interests come first. This new tenant can easily shift your ability to negotiate on their behalf by innocently having an “over-sharing” conversation with their current landlord, whom they may see more often and have more of a history with than they do with you, as their new CRE broker. Even if the above occurs, the consummate CRE professional calmly explains why it’s a disadvantage to their client who essentially opened all, or part of, your playbook to the other side. This goes a long way to building and earning their trust in you. Additionally, you can use the opportunity to reassure them that they don’t need to become a real estate expert. That’s why they have you representing them. Suggesting that they do what they do best, be it a doctor, lawyer, accountant, retailer, etc. and referring all calls to you can be the burden-lifting conversation that they want/need to hear. Your client will have more respect for you and your talents as you demonstrate your value to them. In the instance of representing a medical client as an example, your knowledge of current flooring options, exam room sizes, efficient layouts, cost of build outs, etc. all add to your credibility and trust factor. One of the biggest turn-offs to clients is their broker’s lack of competence in the area of that client’s business. Even when referred to a client, be up front from the very first conversation. Let’s say you were referred because you sold prime retail land in a community and now you’ve been invited to do a listing presentation for an industrial park a few miles down the road. While you may have the geographic expertise, you may lack the knowledge on the latest trends in the industrial sector. This is a great opportunity to team up with a colleague for the presentation and listing. The team approach demonstrates to the property owner that you have their best interests as top of mind. Combining the local geographic expertise with the colleague who knows how to add value for their particular type of real estate serves to benefit the owner: from pointing out the proximity to the heavy rail line at the rear of the property or the uses to market to when there are no municipal services at the property, this all adds to your credibility. Property owners, landlords, tenants, buyers, etc. have access to significantly more public information than ever before, so there is no longer a need for them to hire a broker who is “learning the ropes on their dime and time”. Even experienced brokers should recognize their level of expertise on a specific property type and “stay in their lane.” They can accomplish this by either teaming up with an experienced colleague in that property type or referring the new client to a colleague, who can best serve the needs of the client. 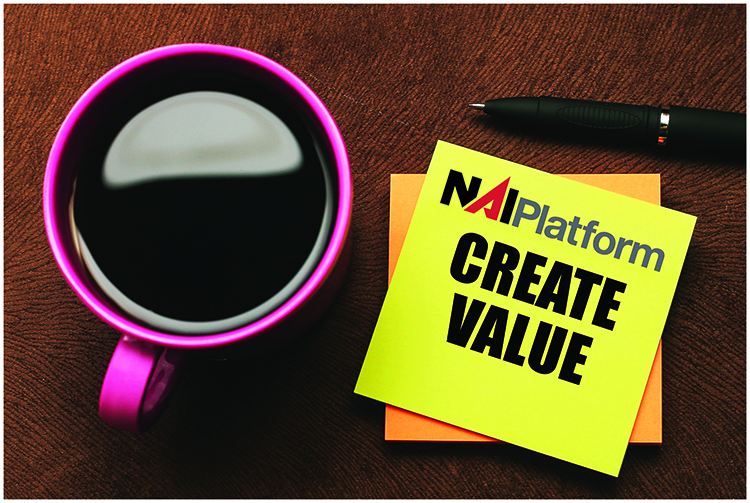 Our brokers at NAI Platform possess extensive knowledge and experience of the industry’s intricate nuances, with a singular focus of working diligently to help our clients meet and surpass their goals. For more information and expert guidance on your commercial real estate needs, please give us a call at NAI Platform or visit our website at: www.naiplatform.com.